A little too much going on tonight to blog, but for those we free time tonight (meaning Friday night), come on out to the Ace of Clubs on Great Jones Street, downtown. 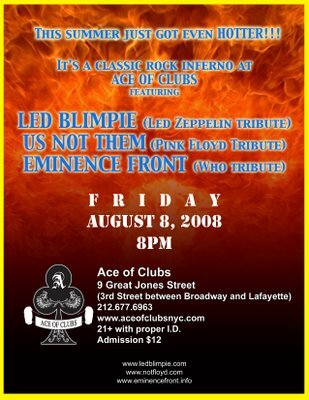 The Floyd tribute band I key in will be playing the middle set in an all classic rock behemoth night, with a Who tribute and a Zeppelin tribute. I'm guessing the Jonathan Richman tribute had a scheduling conflict. All of this means I also need to take a couple of hours tomorrow to tech my Rhodes, which has been acting a little funky the last couple of weeks. Most likely, it's just not used to all of this activity. Hope to see anyone who can make it! Since I'm going back to school in the Fall, I've had to cancel my association with the band, so this will be my penultimate appearance. The last show is in late September, but since they've already started practicing with my replacement, there may be a chance that I'm not playing that one. But this one's a lock.